To date 45 bird species have been observed at Brookfield. We also hope to encourage the nesting of other species of birdlife, as well as other wildlife. There are a number of native wildlife species that we can realistically hope to attract here. Wildlife have a number of requirements in order for them to survive. Habitat requirements vary between species but the basic requirements are common to all living creatures, including humans (ie food, water, shelter, place to raise young). We must address these to attract wildlife. Planting native wildflowers, shrubs and trees will provide the foliage, nectar, pollen, berries, seeds, and insects that wildlife require to survive. Wildlife needs shelter from people, predators and weather, such as native vegetation, tree hollows, shrubs, thickets or even dead trees. Wildlife needs a sheltered place to raise their offspring. Many places for cover can double as locations where wildlife can raise young, from wildflowers and bushes where many butterflies and moths lay their eggs, or tree hollows where bats, possums and birds can roost or nest. Bushy undergrowth should encourage Blue Wrens, Red-browed Finches and Yellow-tailed Thornbills (common at lower Arnolds Creek). Wattles, peas and sennas (and their seeds) may even encourage Bronzewing Pigeons (a pair of these lived at Little Blind Creek in Kurunjang during the drought and one was seen at Brookfield early in 2009). Aquatic and emergent aquatics should provide cover for native fish, frogs and invertebrates, which may in turn attract herons, egrets and kingfishers (seen at lower Arnolds Creek and other local creeks in warmer months). Other birds found at lower Arnolds Creek (and other local creeks) such as Grey Fantails, Little Thornbills, Brown Goshawks, pardalotes, scrubwrens, and cuckoos etc, may return with the planting of more native vegetation, especially prickly understory plants. Possums are absent from this site at present. 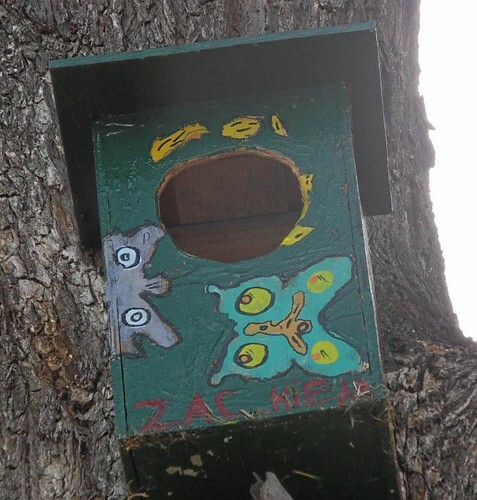 Nest hollows for native wildlife will be enhanced by placement of appropriate nest boxes. 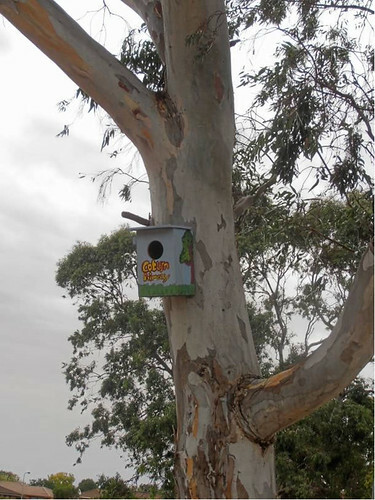 There are many ancient gum trees here with natural hollows but the provision of nest boxes should improve nesting opportunities for birds such as ducks, owls, parrots, galahs, corellas and possums. 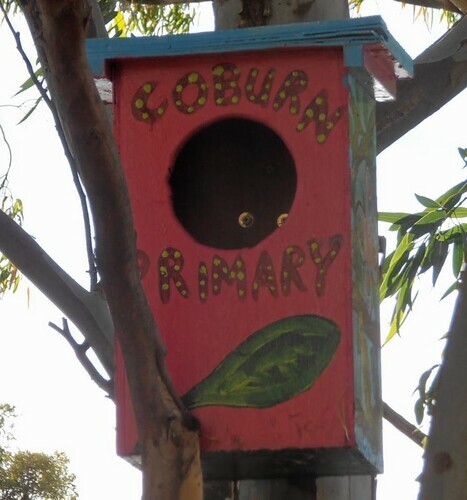 Large boxes may even be suitable for cockatoos and kookaburras, as these require very large hollows. 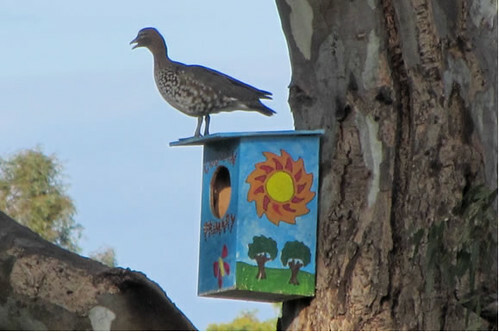 In 2010 MEG member Doug Godsil suggested that we ask the Mens Shed to build nest boxes for MEG to house local wildlife. 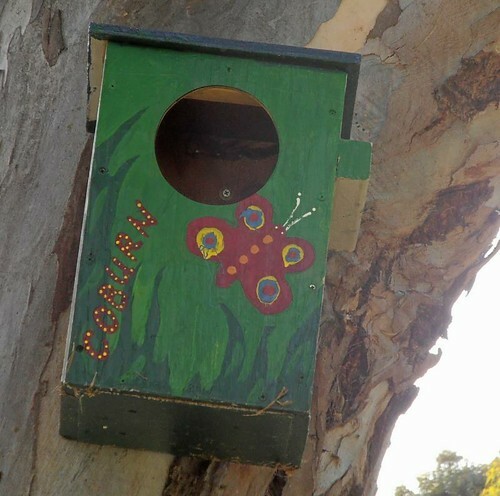 The Mens Shed had already built many wildlife boxes for Wildlife Victoria for bushfire affected areas. The Mens Shed was happy to support this project. On Tuesday 22nd June 2010 Doug Godsil and Daryl Akers of MEG visited Melton Mens Shed where Darren Cunningham and Gil Ellis presented us with eight wildlife nest boxes built by the Mens Shed. 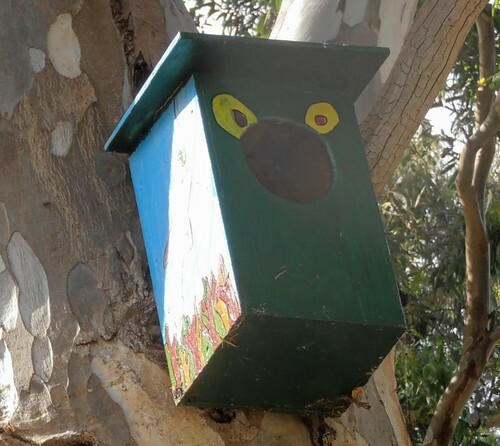 Wildlife Victoria has endorsed our use of their nest box design for use in Melton. Another seven nest boxes were picked up a couple of weeks later. The boxes were built with holes of 2 different diameters, to suit different wildlife. 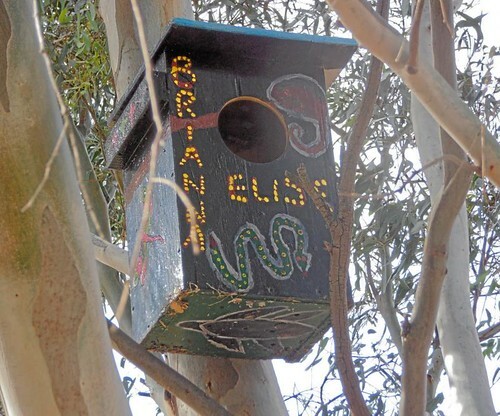 These should suit a variety of local wildlife including: parrots, corellas, galahs, ducks, kookaburras, owls, possums etc. Hopefully we should have other joint partnership projects in the future. These boxes were built totally from recycled timber, making this project an innovative example of practical recycling, in keeping with Melton’s recent winning of Victorian Sustainable City of the Year award; as well as providing homes for local wildlife along Arnolds Creek. Many thanks to Melton Mens shed. On Friday 3rd June Melton Shire awarded Grants for World Environment Day 2011 to 5 local community environmental groups. MEG will use this grant to place the nest boxes in trees beside Arnolds Creek. 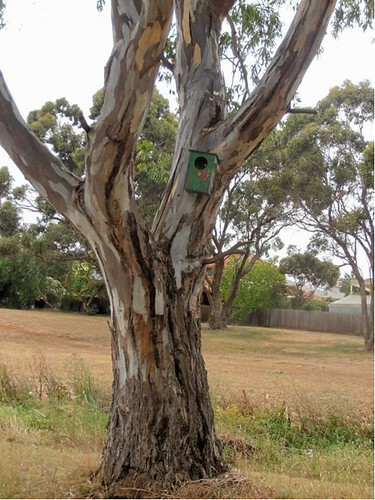 Melton Environment Group corporate member Western Land Services have agreed to place the nest boxes local trees as they need to be placed at least 5 metres from the ground, and in accordance with OH&S practices. This will be done by a 2 man crew with ladder training, ladder will be secured by a person at bottom, and tied to tree at the top. The nest boxes will be placed in local trees by Melton Environment Group corporate member Western Land Services, funded by the grant from Melton Shire. This project is an excellent example of a community environmental group working in partnership with other community groups, schools, local authorities and local business to improve our local waterways. These will not only be habitat for wildlife but examples of community art. Where else will you see wildlife nesting inside works of art? 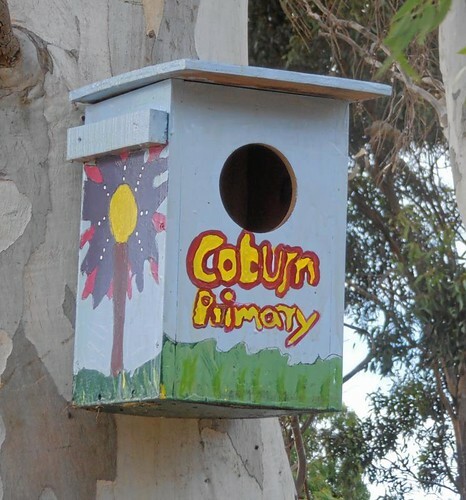 On Tuesday 17th January nine nest boxes painted by students from Coburns Primary School were placed in trees beside Arnolds Creek by environmental contractors Western Land Services, on behalf of Melton Environment Group. The nest boxes had been built for Melton Environment Group by Melton Mens Shed. The boxes were built with holes of 2 different diameters, to suit different wildlife. These should suit a variety of local wildlife including: parrots, corellas, galahs, ducks, kookaburras, owls and possums etc. These boxes were built from recycled timber, making this project an innovative example of practical recycling; as well as providing homes for local wildlife along Arnolds Creek. 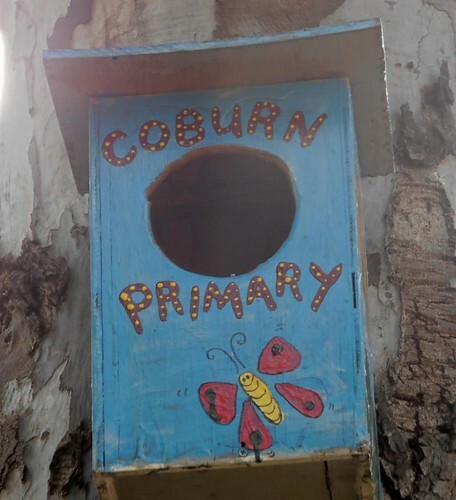 The nest boxes are beautifully painted and the students have displayed both imagination and artistic talent, under the guidance of teacher Mel Spencer. 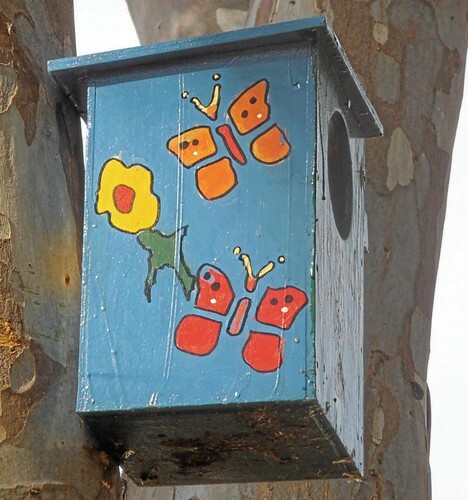 They have been painted in environmental themes including brightly coloured flowers, birds, dragonflies and other insects, possums, lizards and other wildlife etc. 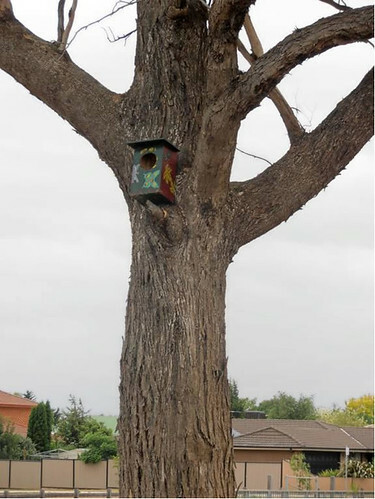 The nest boxes were returned to the students to complete the job, as they suggested. A good example of why we should listen to young people! The nest boxes were placed in trees, at least 4 metres from the ground, by Melton Environment Group corporate member Western Land Services, funded by a World Environment Day grant from Melton Shire in 2011. The boxes were placed in the trees in accordance with guidelines from LaTrobe University, facing east so they will enjoy the morning sun but protected from the harsh afternoon sun by the tree trunk. Melton Environment Group is grateful to Melton Shire for providing environmental grants of $1000 each to five local community environmental volunteer groups. This project is an excellent example of a community environmental group working in partnership with other community groups, schools, local authorities and local business to improve the natural environment of our local waterways. The distinctively painted boxes will remain brilliantly coloured tributes to the students who painted them so imaginatively. 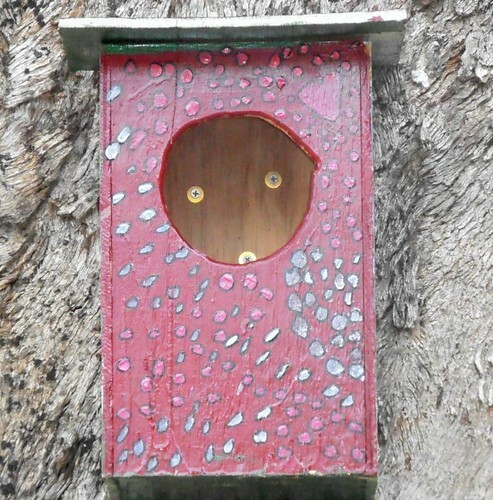 They are not only homes for wildlife but works of art! These will not only be habitat for wildlife but examples of community art. Where else will you see wildlife nesting inside works of art?